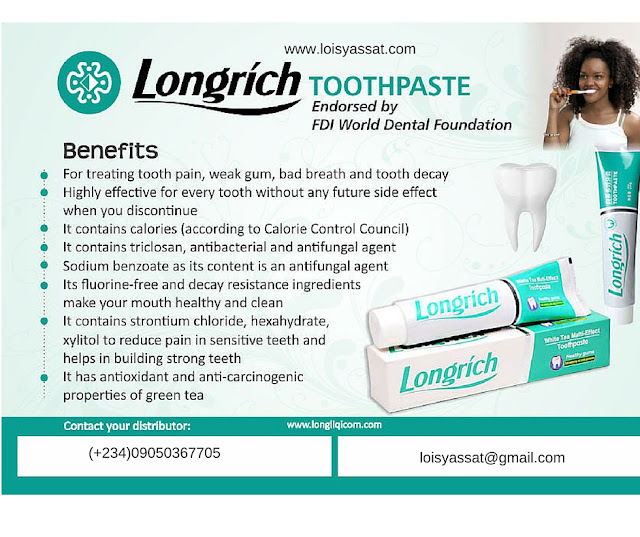 Main Ingredients: This toothpaste has the ingredients of the herbal dental formula which are calcium, menthol, strontium chloride and aloe extract among others. This formula is fluorine free. Helps to reinforce the root of the tooth. Helps to prevent tooth decay, and eliminate fungi and bacteria from the gum. It stops  gum bleeding over a period of usage. Leaves the mouth ever fresh and healthy. Prevents the teeth from having holes or the user having mouth odour. It helps to remove plagues from the teeth. Oral hygiene is one of the most important part of the body to pay a close attention to. Longrich being the leading Chinese chemical industry with products related to health and skin care, undoubtedly has one of the best Toothpaste you can confidently rely on. For treating tooth pain, weak gum, bad breath & toot decay. Highly effective for every tooth without any future side effect when you discontinue. The blend of Strontium Chloride & Aloe Extract in it can protect gum & strengthen your teeth at the root. It contains calories(according to calorie control council). It does not contribute to tooth decay & may reduce tooth cavity. It abrasive to clean teeth, remove plaque & it has a dispersant properties. It has an antioxidant & anti-carcinogenic properties of green tea. It contains Tricolosan which is antibacterial & antifungal agent. It provides an extra benefit to health beyond it anti-gingivitis effect in toothpaste. It contains a mineral supplement required by living organism. It contains strontium chloride hexahydrate to reduce pain in sensitive teeth & helps in building bone. Sodium benzoate as it content is an antifungal agent. Suitable for all age from 2 year onwards.